Thanking Vlasta for her help and time, we drove on to Nedašovce, just minutes away. Mayor Elena was on holiday, but we stopped and parked in front of her office for a photo op. From there, we walked to the home of ING Anton Kajaba and his wife, Andrea. We had first met Anton two years ago in Mayor Elena’s office. He was the one to direct us to the Diviš house, as well as the cemetery. He was also the first to mention the shoe trade and Josef. Anton’s title of “ING” reflects his academic training as an engineer. Anton is 80 years old now, born in 1937, and he claimed to be the second-oldest surviving resident in Nedašovce. We gathered around a table in his yard to talk, his wife brought us soda and pastry, his beagle dog yapping….in Slovak, I imagined! I pondered what it must be like to be deaf, for while I heard them talking, I did not understand any words of this conversation. My team translated during pauses, updating me, as Anton talked. Mostly he remembered Anna (born 1936) and her younger sister Margita (born 1938), the two youngest daughters of Josef Diviš. Josef would have been about 17 years old when my grandfather left Slovakia in 1910 for the USA, so understandably, Anton does not remember Stefan, nor much of Josef. Anton reminisced about dancing with Anna and spending time with her. Our visit was pleasant and entertaining — well, I thought it was! But we left without any new information or clues. From Anton’s house, we walked to the cemetery. Even though it was my third visit to this little country village, I once again pinched myself to be sure that I was not dreaming. It was just as exciting and unbelievable to be there again. The cemetery was a short walk, resting quietly in the same location we left it a year ago. Again I was struck with the enormity of headstones and grave markers. Miloš told me that Slovaks saved their whole lives so that they could afford these burial monuments. But unlike American customs, the Slovaks rent the plot of land! Inquiring minds want to know: What happens if the rent isn’t paid?! My fellow team members, now sleuths, spread out – examining each stone’s etchings. 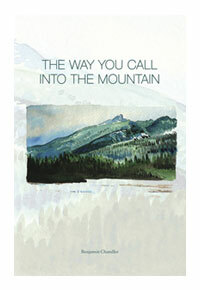 Surely others of the Diviš family are here, but where? Slovaks frequently visit their departed loved ones, and artificial flowers decorate many grave sites if not fresh flowers placed or planted around the plot. Many stones are worn smooth with time and the names are unreadable. There is one area that has mostly unmarked small graves. If only we knew what secrets those held. We had scoured this cemetery twice before, and our only discovery had been the grave of Josef Diviš. So now, we gathered around and stared intently at his marker. His headstone declared his life and death, Sept 9, 1892-Aug 20, 1960. His wife, Maria Jedlickova, next to him, lived from Feb 2, 1901- Oct 14, 1994. Ivana was searching a few a rows away from us and suddenly called us to join her. 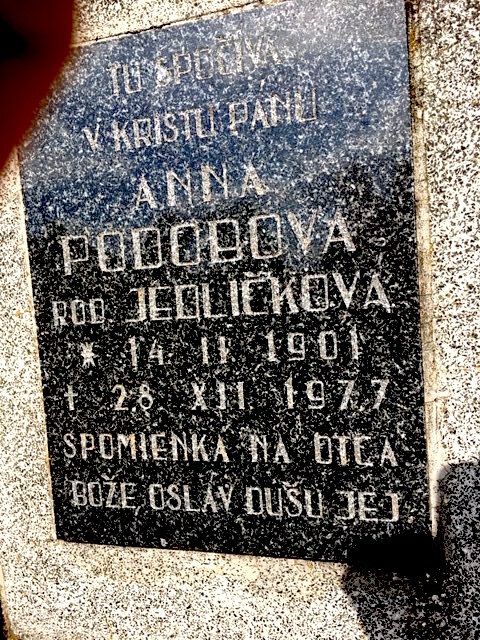 In front of her was a grave marker for Anna Podobova rod Jelickova. Pointing out the dates on the stone, Ivana observed that Anna’s birthdate was identical to Maria’s. Could they be twins?! It seemed like a very real possibility as both stones had the name “Jedlickova.” This grave site looked well-tended, not grown over with grass and weeds. It was decorated with the traditional candles seen on so many of the graves. So we wrote a note, in Slovak, inquiring of the family of this twin, suggesting that I might be related, would they please contact me or Miloš. We put the small scrap of paper inside the glass candle holder and by the grace of God, perhaps someone will find it! This must be the equivalent of a note in a bottle tossed out to sea! Feeling we had turned over every possible stone here – well, not literally – we walked back toward the center of town. We had yet to see the Diviš family house, so we walked, watching for it. Soon we found it, and paused to look it over. There was a huge, gaping hole on the right exterior wall. A man could jump through it! Sitting in front of the right side of the house was a man who looked very similar to the one we saw in the yard on our visit in 2016. He did not look welcoming then, and we had left without attempted speak with him. He appeared busy pulling old furniture out of the house. This year, he was sitting, watching us. Miloš and the girls were hesitant to initiate conversation and wanted to hurry past the house. As I later reflected on that moment, I wondered if the response of my Slovak friends was a product of the culture of Slovakian people rather than of intimidation or fear. Friends and family are warmly embraced. But to the passerby on the street, eyes are averted and there is no acknowledgement as the two strangers pass, no contact is made. I have come to understand that this is likely due to the hostile, even dangerous climate the country existed in under many foreign and later communist regimes. Strangers could not be trusted and therefore no contact was made.